When April L. Hamilton first saw the Amazon Echo in 2014, she knew it was the future. As an Amazon Prime member, April had an early preview of the new device. She immediately knew Echo would be the theme of her next website and blog. Amazon Echo users and Alexa skill developers will likely know April from her website, www.lovemyecho.com. The site has become a collection of Alexa developer resources, “how-to” articles, news features, and even downloadable Bingo-cards (more on that later). How does someone become a noted authority on a new, rapidly-evolving technology like Alexa, in such a short time? We sat down with April to find out. The internet of things enthralled both the technologist and app developer in April. As a blogger, she wanted in on the ground floor with something that had real potential. When Amazon offered its Prime members the chance to pre-order Echo, she knew the internet of things had finally arrived. Next, she had to figure out how to set up a consumer blog for something so new. April knew Echo would excite consumers and developers alike, and they’d have plenty of questions. With her programming and writing background, she wanted to be the one to answer them. April knew it would be tough writing with authority about something so cutting-edge, but she wasn’t afraid to learn. In fact, April says her prime motivator was the sheer joy of learning about a new technology. So she signed up for Amazon’s Developer Day in early 2015 to get some hands-on experience with the device. She wondered what skill she could create that consumers would enjoy. Beyond that, she wanted to build an Alexa skill that would intrigue her colleagues, so they too could see the potential of Amazon Echo. After Developer Day, April joined a group who had early access to documentation on the Alexa Skills Kit. Learning the voice user interface and the SDK was simple because she understood how to use JSON payloads to talk between the cloud and an Alexa skill. The first Alexa skill she created, Crystal Ball, was a simple “fortune cookie” skill. You invoked it and got a single response back, nothing more. It was a good start and helped her gain a better understanding of the Alexa Skills Kit. April’s second skill, Focus Word, was focused on how bringing positivity to the lives of people. Her skill provides a daily affirmation word and still maintains a 4.5-star rating. Since publish, about 7,000 users have enabled the skill and peak usage is about 1,200 invocations per hour. April continued to develop more Alexa skills, including the Bingo and Angry Bard skills. 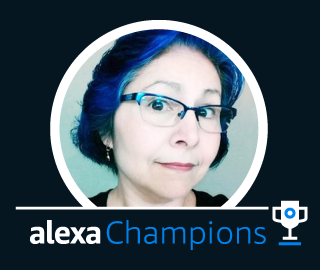 Having joined the early ranks of Alexa developers and continued development through publication of many Alexa skills, April set herself up as an authority figure on Alexa. Her expertise goes hand-in-hand with her love for blogging. Today, April publishes regular articles on Echo, Alexa, tips and tricks and more. She is also a natural teacher, documenting and sharing what she learns. For example, the Bingo skill needed to hold data from one interaction to the next, such as the numbers already called. “In the past I’d have cached them in the browser. But here there’s no GUI at all,” April said. So she learned how to use session attributes to pass the data back and forth between app and server. Seeing other developers struggling with similar issues, she documented her method and posted it to help others. April believes voice user interfaces are the future, meaning more programmers will turn to developing Alexa skills. With templates for everything from simple request-response skills to interactive games, technical documentation, and other training resources, Amazon makes it easy to get started with the Alexa Skills Kit. In April’s view, IoT is here now, and working with Alexa makes you invaluable and helps you add another tool to your toolbox.